Jôice Cleide Santiago was the only black woman and follower of Candomblé at the Fé no Clima (Faith in the Climate) conference that took place in Rio de Janeiro. She belonged to a religious minority at a gathering that was supposed to be inter-religious, but the majority of its participants ended up being Christian. She is from Salvador, but currently lives in Lauro de Freitas, Bahia. Graduated in social services, she is also a harm reduction technician. 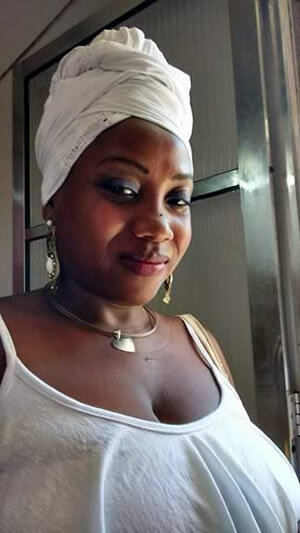 She identifies herself as a follower of the Keto Nation (Nação Keto), daughter of Ilê Asé Opô Alafunbí, line of Candomblé: “I am Iaô de Oyá – in my religion, a child, a very young person. But with every day that I discover and live, this religion empowers me as a woman and makes me hope for a better future. I am the mother of Julyana Omi (Juliana of the waters), also a follower of Candomblé and the partner of an incredible guy, son of Xango. A family linked to spirituality”. She currently works as an artisan with jewellery linked to the religion of African origin. “My current work is a way of fighting against stereotypes and strengthening the beauty and the magic of the African matrix, my people”. But it is through her experience with religion and her work that she has developed with Quilombola women that she analyses the relationship between environmental racism, religion and the situation of black women. Last year (2016), Jôice worked directly with women from three Quilombola communities and with another 15 indirectly in the project Trade with Identity developed in Bahia by Koinonia Presença Ecumênica e Serviço (Koinonia Ecumenical Presence and Service), a non-profit organisation run by people from different religious traditions and that works at the national and international level. Koinonia’s main objective is to mobilise solidarity and offer services to historically and culturally vulnerable groups that are going through processes of social and political emancipation. “If you think things in the city are bad, when you arrive in these [Quilombola] communities, it becomes clearer that that is where patriarchy and racism are”, she states. Jôice worked with Quilombola women in Camamu (a Brazilian municipality located in the Costa do Dendê, or Palm Oil Coast, on the southern coast of the state of Bahia). Her work consisted of providing training on the issues of racial identities, gender, solidarity and the feminist economy, public policies and the INCRA (the Instituto Nacional de Colonização e Reforma Agrária, or National Institute for Colonisation and Agrarian Reform, which is responsible for managing public land and demarcating the territories of Quilombola communities and providing them land titles). The word “quilombo” is of Bantu origin and means “warrior camp”. The quilombos were made up of mainly black people who survived as slaves on ranches and who fled to these territories to live collectively. They are historical places of resistance and currently include the black and rural population defined by its relation to its ancestry, the land and its own religious and cultural practices. Privatisation, deforestation and the precariousness of the territories occupied by the Quilombola communities threaten their means of subsistence and force entire communities to migrate and into misery and oblivion. She argues that her struggle is against not only religious intolerance, but also environmental racism – that is, against environmental and social injustice that always hits the most vulnerable the hardest. For Jôice, environmental racism works like this: “we, followers of Candomblé, need sacred spaces in order to give our offerings or our gifts to our deities. But in certain places, this is no longer possible because forests were cut down to develop the city with subways and roads. There are less and less green spaces in Salvador. This reduced our space, leaves us in places with no contact to nature. Our offerings in the street get broken or kicked. If you are a follower of Candomblé and go outside your area, you automatically suffer from racist attacks, from assault. It is as if you are only allowed to survive within your own territory. Outside this space, I am not well thought of if I am a follower of Candomblé. There are limits on our place, territory and religious practices”. The Koinonia project with the women from the quilombos aims to strengthen the women’s financial capacity by helping them do business. In Camamu, for example, a lot of cocoa and cupuaçu is produced, but the work is done by men – assisted by their partners – yet many women never have access to money. “When women plant things in their yard, such as coriander and tomatoes, they can then sell them at the market. These are small elements of empowerment, allowing these women to have to economic autonomy, even if it is only minimal. They become aware of the fact that they can grow things and that this can be a possible source of income; and even a possibility for survival that allows them to provide for their families without depending on their husbands”, she explains.